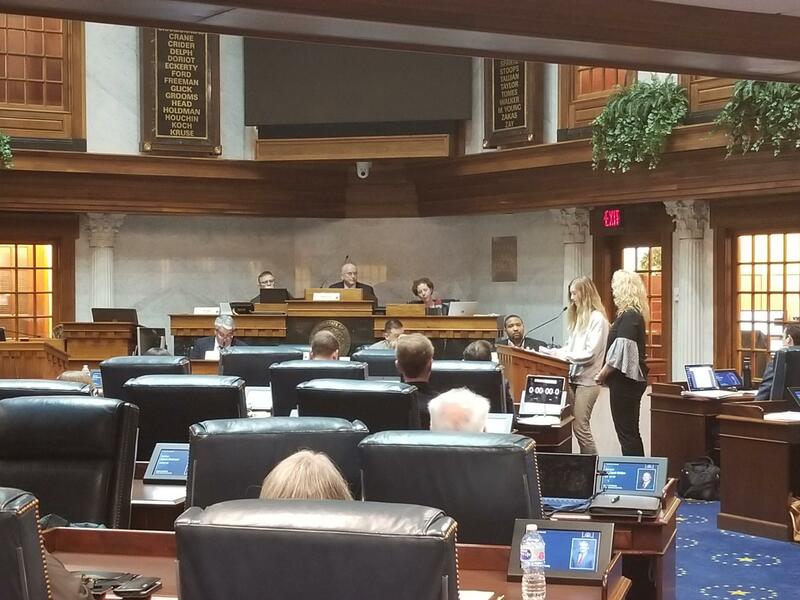 Paige and her Mom Keri Moore, testify in the Senate Education and Career Development Committee on House Bill 1420. Students with disabilities in non-pubic schools have something called Individualized Service Plans, or ISPs, and public school students with disabilities have something similar, called Individualized Education Plans, or IEPs. The Indiana School for the Deaf only accepts IEPs. But private school student Paige Moore, and her mom Keri Moore, have been working to change that. Paige is deaf in one ear, and partly deaf in the other. Eventually, she won't be able to hear at all. She could enroll full-time at the Indiana School for the Deaf, but she says she still wants the academic challenge of her private school. Keri Moore says the school her daughter attends, has done its best to accommodate Paige Moore, but she's still had to work twice as hard, in and out of class. "Even though she manages, it's emotionally and physically exhausting for her," Keri Moore says. House Bill 1420 would allow Paige Moore to take core classes at her private school, and electives for learning things like sign language, at the School for the Deaf. She would also be able to participate in sports there, something she's struggled to do at her current school. The Moores have advocated for the bill throughout the legislative session, because Keri Moore says, it would ease the challenges her daughter faces. Paige Moore told her mom last year, that something needed to change. "Working and trying to hear and figure things out during her school days because of lack of communication has been breaking her down," Keri Moore says. Some lawmakers have said they want to expand the provision to include the Indiana School for the Blind. The Senate Education and Career Development committee approved the legislation, and it now heads to the full chamber for consideration.